Decorate your home with these wonderful looking framed apparitions décor. 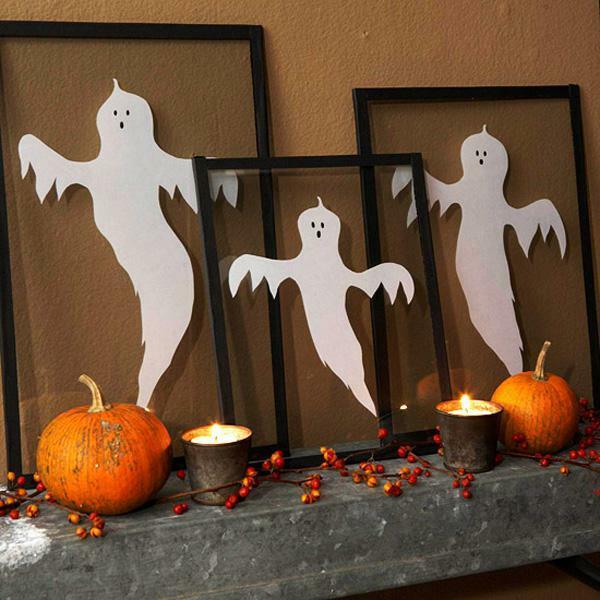 Simply get yourself clear frames and design spooky characters in paper. 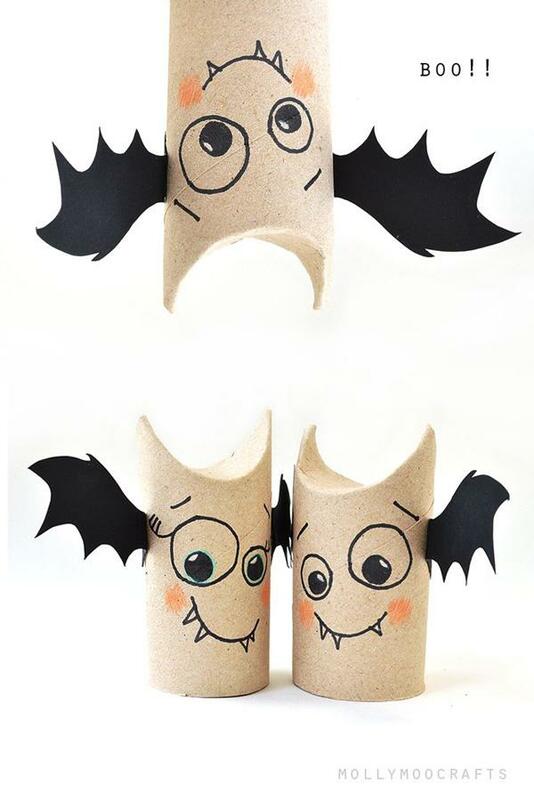 You can even use colored paper for creating characters such as Dracula and Frankenstein. 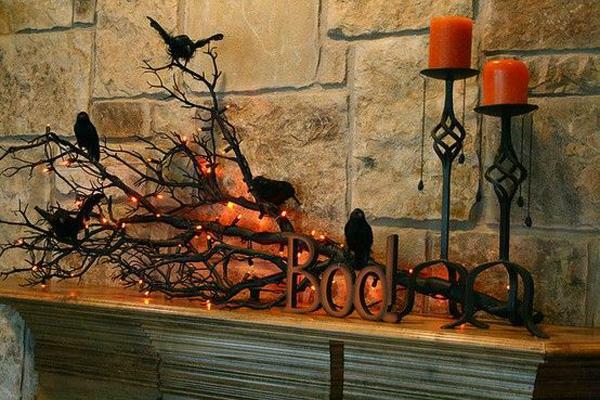 One of the most exciting things to when Halloween is just around the corner is to start decorating the house! You can begin with this one design and so on then before you know it, you’ve finally transformed the entire house into a mad scientist’s laboratory! Even though a lot of people want to take it easy and buy from the nearest Halloween shop, you do not and to follow suit. A lot of the pre-made decorations can cost a lot and if you’re on a tight budget this is not the best option for you. Don’t be too jealous of those animated and life sized inflatable skeleton and Frankenstein dolls because you can always do better with your own imagination. When you want to decorate the house for yourself or to impress your neighbors, there is no need to overspend on budgeting for the Halloween. You can always decorate beautifully with the used of old materials or those items that have been lying around in your home. With the help of a few simple tools and supplies you can recreate some spooky Halloween character on your own. You can even use the time as a bonding moment for you and your family as you create creepy Halloween decorations. All it takes is a good imagination and creativity. 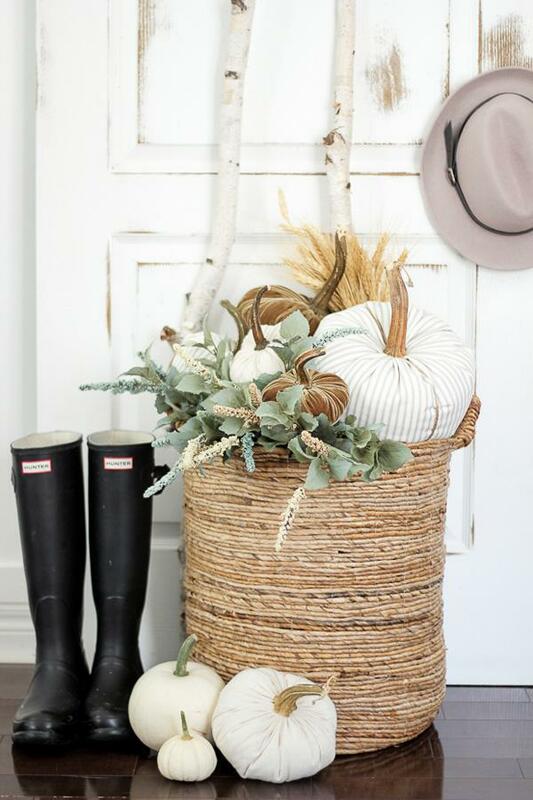 There are also a lot of options when you are designing your house for the Halloween, you can start on the porch and end with goodies in the backyard. It also depends when you are throwing a Halloween party inside or outside of the house. You can find lots of things that you can do with props on trees and benches that will fit right in the theme you are working on. Below are some tips on Halloween decorations you can get inspiration from. Another thing you can play with in your yard is haunted trees. 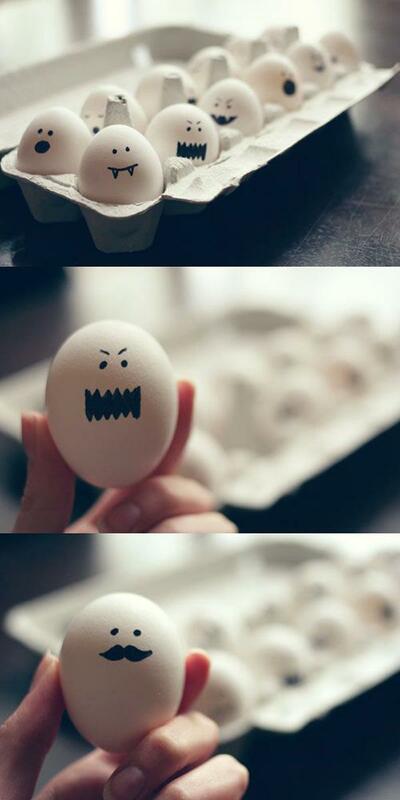 You can recreate them to look really creepy and make them don scary faces. But how can you possibly paint a face and a mouth on a tree? Simple, the answer is creativity. You don’t even need some sort of special equipment to get this done; regular things around the house will create the effect just fine. For this illusion to work you will need oven baked clay. Yes, that is the secret to giving life to your good old trees. Create a pair of eyes, a crooked nose and a creepy screaming mouth for the trees; you can even vary the expressions depending on how many trees you’ve got. Simply attach them to the trunk of the trees which will serve as the main face. Don’t be too afraid that you will spend much on buying the clay. They are pretty much affordable in stores nowadays. You can buy one color of clay or different colored ones depending on the design or theme you are going for, in some cases you may need a colorful ensemble to make the face of the trees more noticeable from afar. Create the face parts of the tree from the clay and bake them inside the oven. You can then use removable putty or double-sided tape to secure the face parts on the tree. Consider placing clay glaze over the baked clay to protect them from things like the rain. Classic but always works, this Halloween idea can make your simple yard into a spooky looking cemetery. It’s not as complicated as it looks; you will just need simple things like reclaimed items to create your very own graveyard. Start with acquiring a cardboard and cut them into tombstone designs. Paint them gray and let them dry; you can also paint additional styles such as cracks on the side of the tombstones or even write on funny names of the dead. When they are dry you can then arrange them carefully to form a small graveyard space. In other cases you can also design the tombstones as haunted pathways leading to your house. You can also use real wood to waterproof the tombstones so that they can last longer and you can reuse them for the next Halloween season. Try and look for thin pieces of composite wood that are easier to cut into shapes. They look better and can stand easier on the grass. Things like moss and even toy insects can be glued at the sides of the tombstones to make them look more authentic and ancient. Whatever design you choose to go for this Halloween, make sure that you put your all into it. A good amount of effort will show on the work which you have done. Keep a minimum budget for the decorations and let your creativity shine thorough. It’s good to get things for Halloween to make your home look like the creepiest place on earth but you should not overspend on it, especially when you are not well prepared. These simple DIY decoration tips can help you work around your budget while at the same time getting the great results you want. Last but not the least, enjoy Halloween and the eternal spookiness that it brings! A very creative and cute looking bat door design. 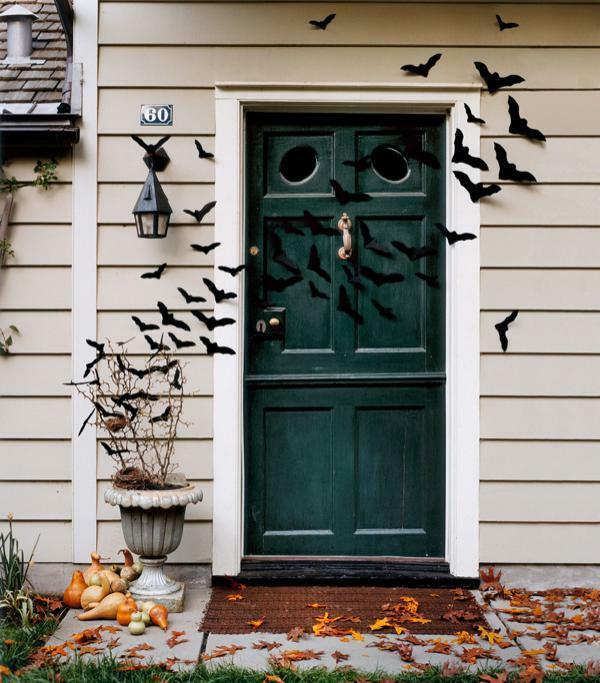 Fill up your doorway with swarms of bats that are seemingly flying over your front door. Easy to make and very interesting to look at. 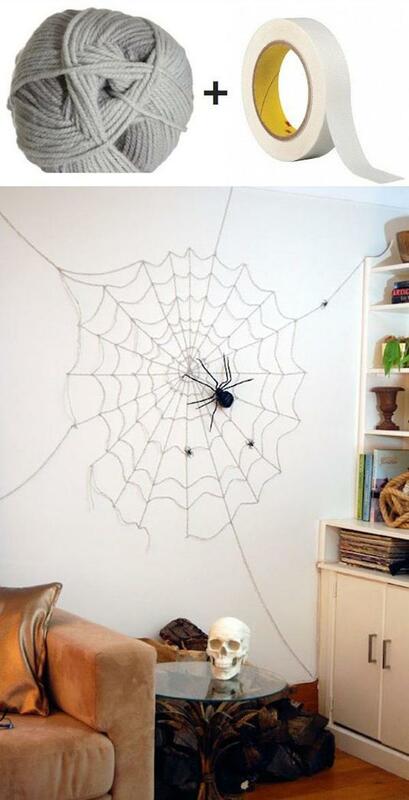 Check out this spider and cobweb Halloween décor. It may look complicated at first but it’s actually very easy to create. All you need is a masking tape and a piece of yarn to work with and of course a creepy black spider toy to complete the illusion. 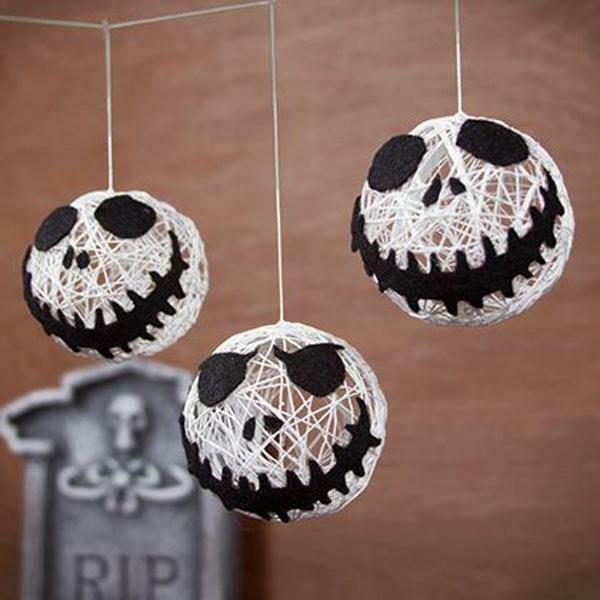 If ever you are a fan of nightmare before Christmas, this is the best possible choice you could make for your Halloween décor. Creepy yet cute and you can even reuse them on Christmas season too. 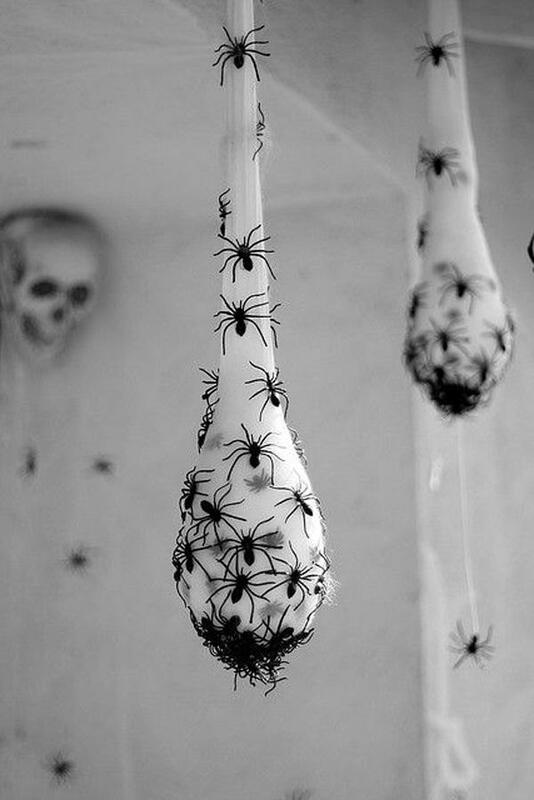 Be prepared to give out the creeps with this spider filled sac hanging from your ceiling. 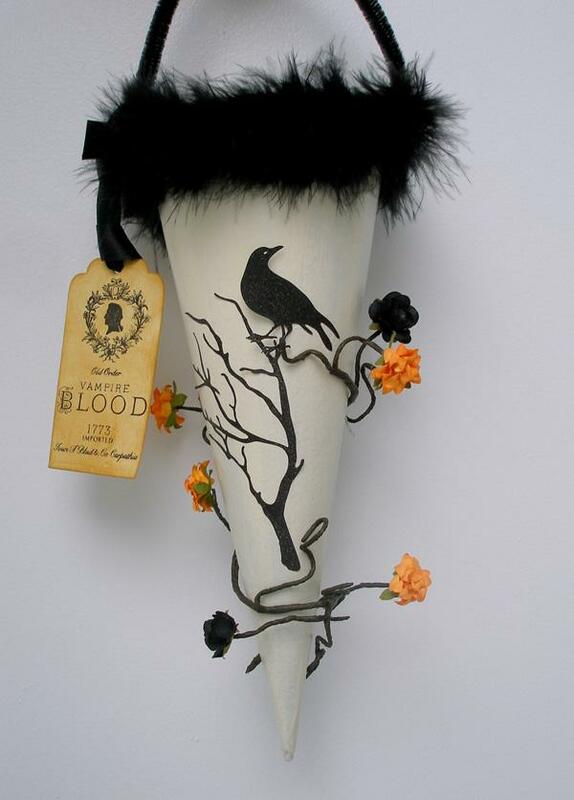 A perfect prop for scare houses and can even give your home a bit of attitude, nevertheless it can look really eerie and perfect for the occasion. Tiny ghost figures. 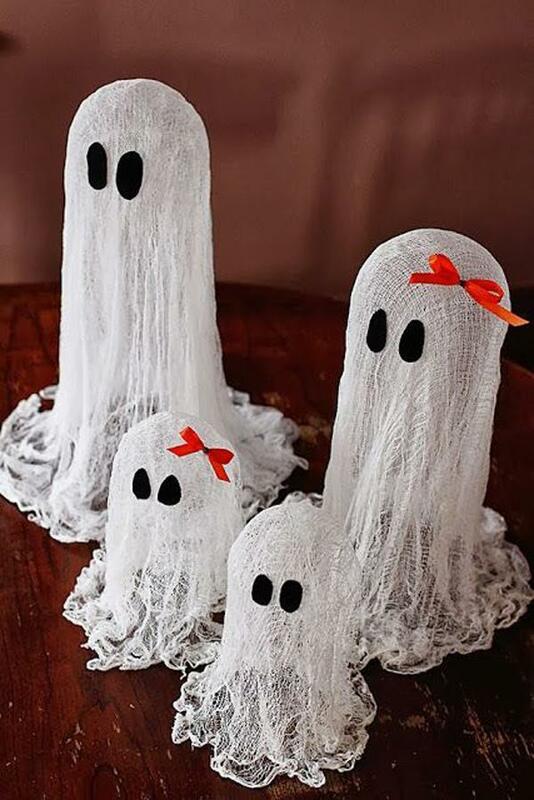 This miniature ghost family figure in cheesecloth looks spooky and at the same time adorable. A perfect centerpiece for your table on your Halloween party. 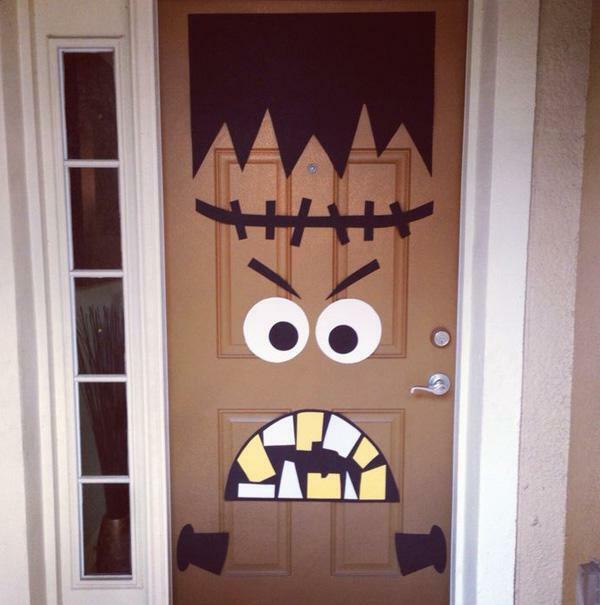 Frankenstein door, a real catch for the cute Halloween style. It’s also a great design to not scare the kids who are trick or treating this Halloween. Orange spiders on a cobweb. The orange tint of the spiders makes them even more vicious and creepy. You can use wires to create the cobweb like structure that holds the spiders in the middle. 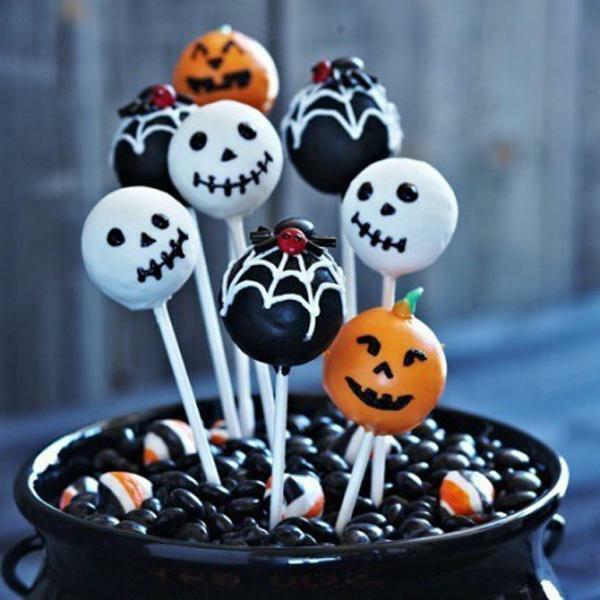 Creepy Halloween head lollipops. A great decoration piece for the center table. On top of that they are very easy to make by yourself. 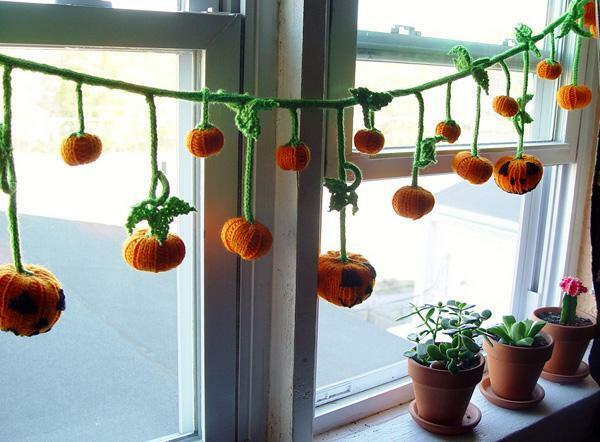 Your very own array of hanging pumpkins. The knitted effect adds to the cuteness of the design. Another great thing about this décor is that you can hang them in just about anywhere. 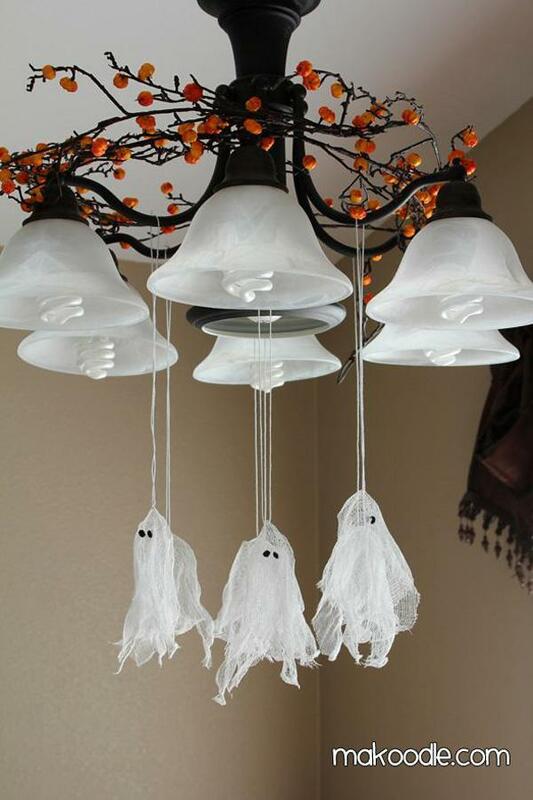 Spice up your chandelier with these spooky ghost apparitions. Very simple to create and easy to hang. 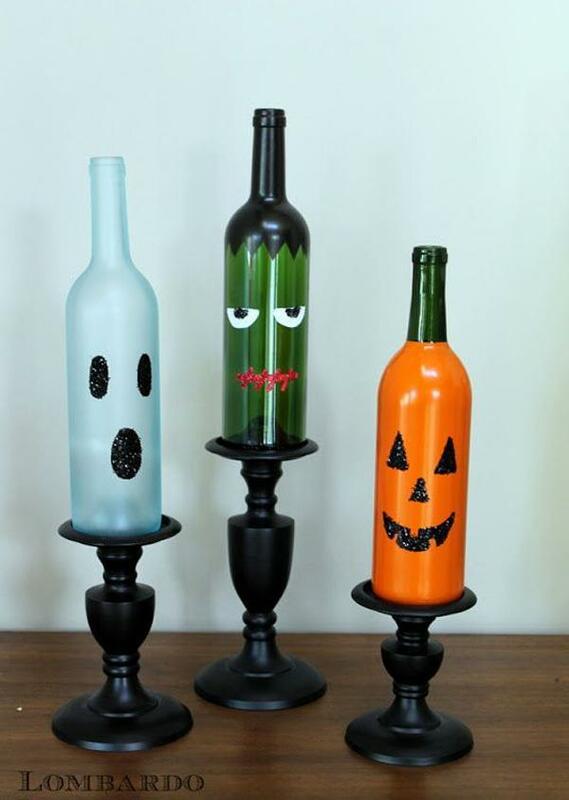 Adorable looking Halloween bottles that you can put on display on your shelves or coffee table. These are fairly simple DIY crafts and can be done in a short span of time. 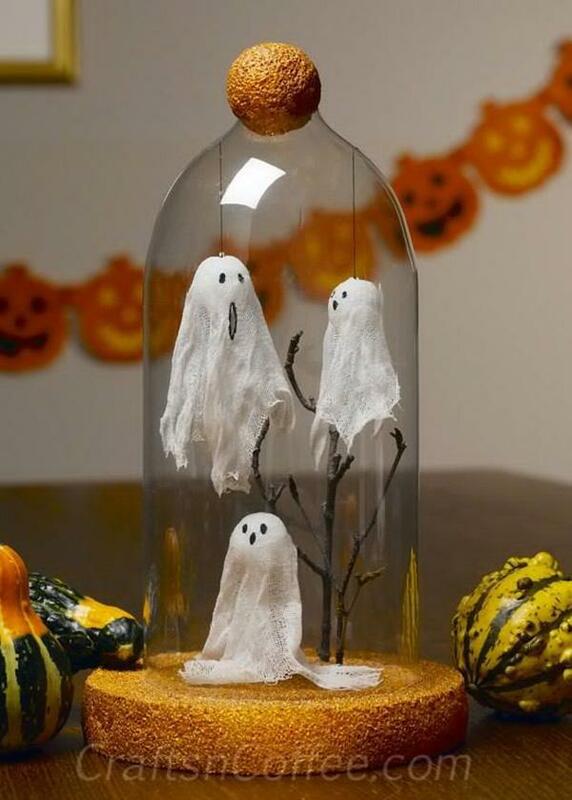 A very creative miniature design of ghosts spooking you out on Halloween. You don’t need special materials to create this one and can simply make use of what you can find at home. Creepy Mr. Pumpkin head with a bag of treats. 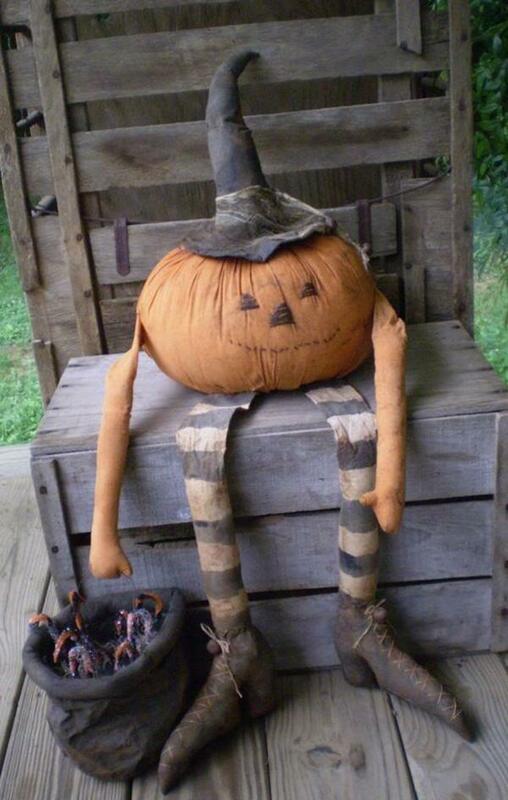 Get creative with your old cushions and create a creepy Pumpkin head using old socks and cushions to complete the arms and feet. Neon Halloween balls. 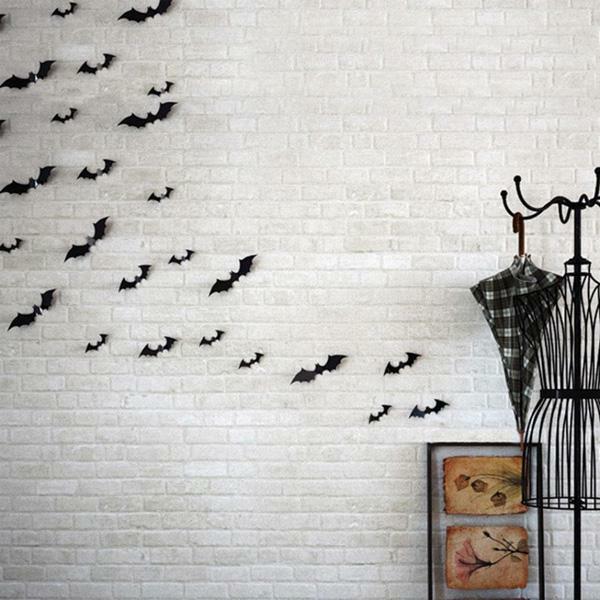 These eccentric looking designs are perfect for that Halloween night party you are throwing at your house. All you need is a bunch of colorful neon pant and pumpkins. Mini cartoon versions of Halloween characters. These are very cute figures that you can place virtually anywhere at home and they will fit just fine. Fun looking hanging bats. You can make this simple DIY Halloween design with just a Styrofoam ball and cardboard cutouts. Add a bit of creativity and imagination and there you have it! Adorable cloth pumpkins. You can create your own pumpkins for display at home when Halloween comes around the corner. Sew up used clothing to create a pumpkin like shape. Sparkly and bold letterings that you can hang on the walls for Halloween. Quirky and elegant to look at. You can create various words from the letters that you will be making. A bat in a box happy Halloween meal. 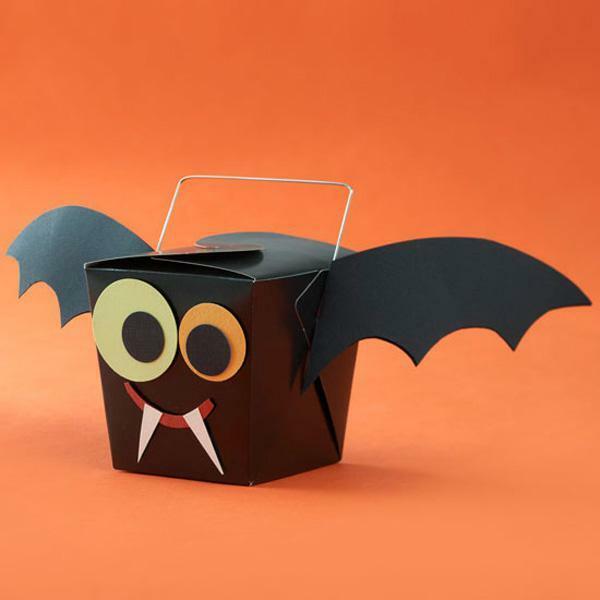 Add attitude to your child’s trick or treat basket by designing it as this cute little bat with bat wings attached on the sides and adorable fangs. A fantastic depiction of a swarm of bats flying against your walls. It looks intricate but it really is easy to create. 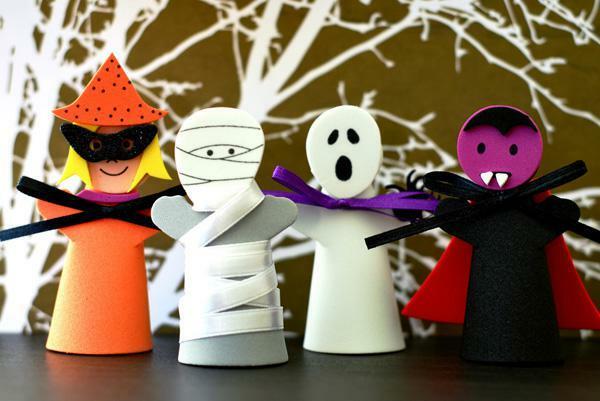 Fueled by imagination and creativity you can make even the simplest crafts work for Halloween. There’s nothing like vintage, even in Halloween. Spruce up your décor by adding vintage top ups in the design such as fur and beautifully handwritten tag. Who says that you can’t eve add decors in your bathroom? These toilet bats surely object. Simple and creative, this décor can bring laughs to your guests who frequent the lavatory. Pretty vase of flowers with a touch of spookiness. 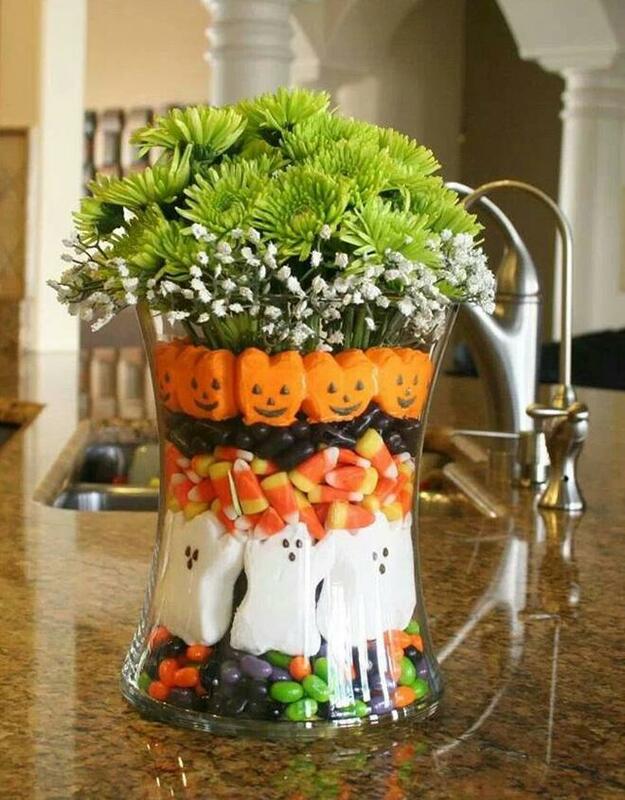 Customize your clear vase with Halloween tidbits such as ghost and pumpkin figures; colorful jellybeans can also make the arrangement look even more attractive. 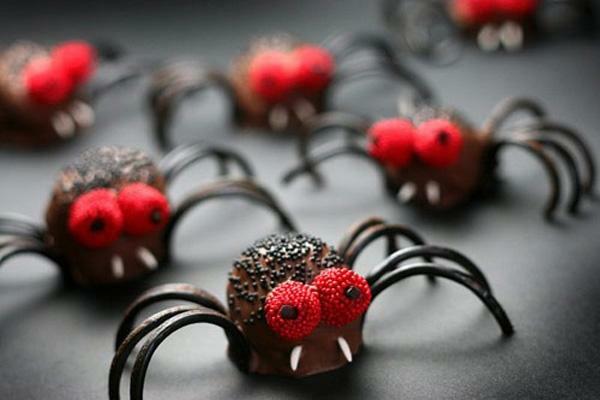 Creepy but cute spiders for Halloween. Take a look at these little critters that can instantly creep out Halloween guests. You can make these yourself at home using simple materials you can find around the house. A group of adorable little pumpkin garland heads. 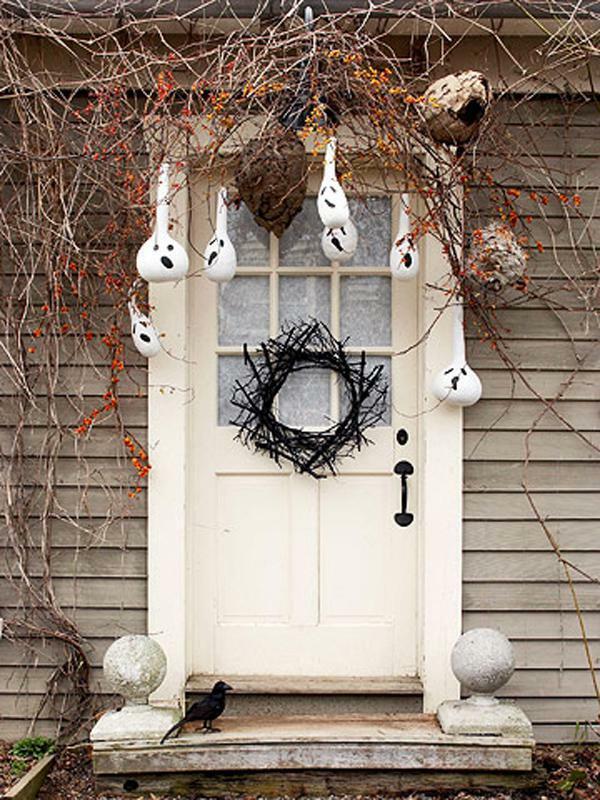 Who says Halloween décor should always be creepy? 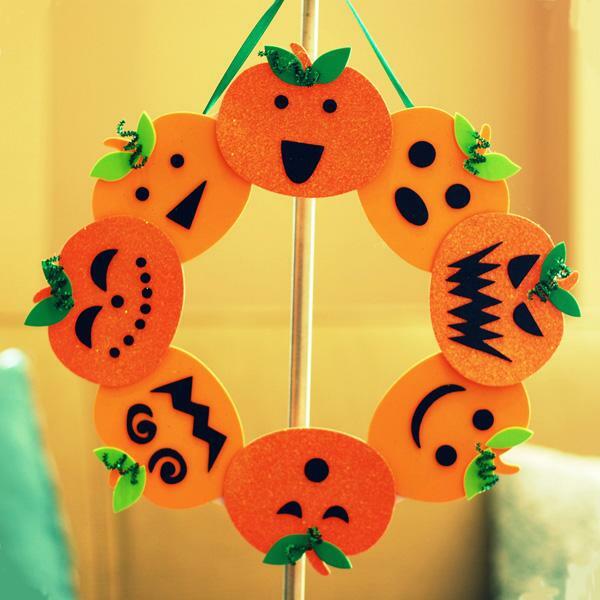 You can customize your own Halloween faces on this DIY craft. 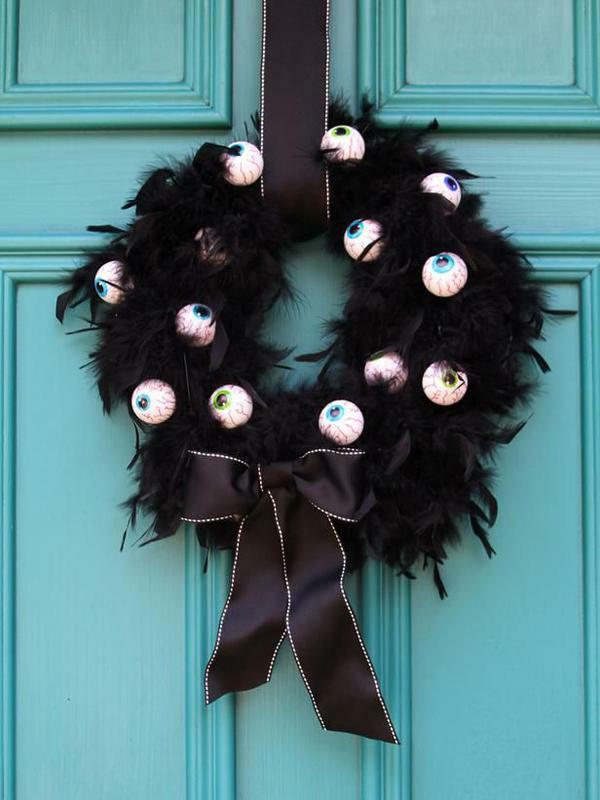 You can find nothing more original than a wreath of eyeballs. Insanely creepy and not that difficult to craft at all. You will need eyeballs, good fur, wires and a ribbon to complete the look. Minion pumpkins. If there’s going to be an attack this Halloween it will most certainly be the attack of minions. 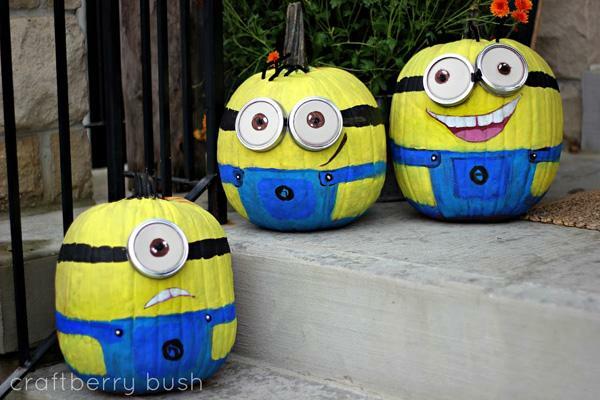 Fill up your doorsteps with minion inspired pumpkins. 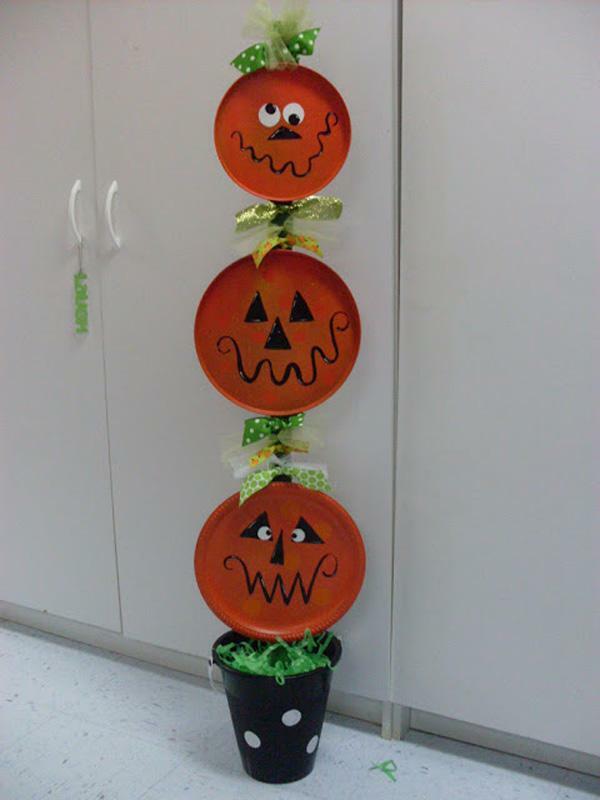 Make your very own quirky pumpkin totem pole. 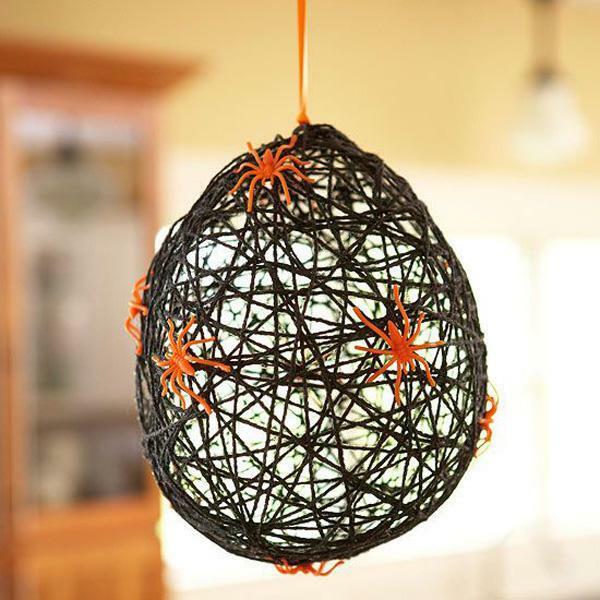 This crazy looking Halloween décor isn’t that difficult to craft at all. You will only need plates of varying sizes, a pot, a pole and creativity. Cat, ghost and bat themed Halloween bottle. This décor is perfect for waiting tables at your Halloween party and can surely draw in interested guests. Funny and cute Halloween egg heads. Even food can be spooky this Halloween and with this ensemble of creepy and cute faces your Halloween décor has just taken a step higher. Time to make those Halloween giveaways look amazing. 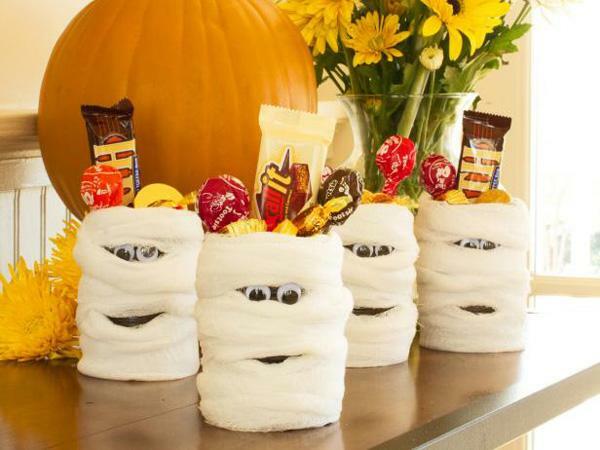 Check this mummy inspired candy cans that you can give out to children trick or treating. Funny and simple to make, you can even make tons in a small amount of time. Halloween tree. 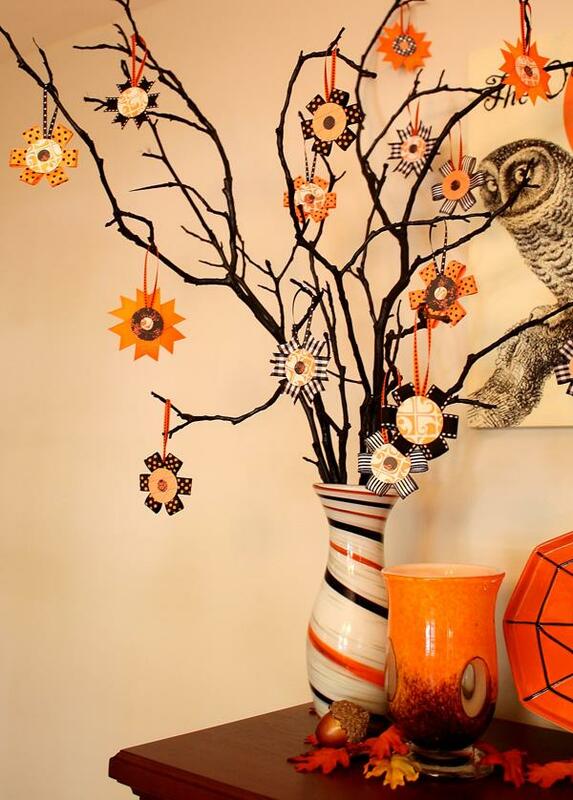 If Christmas has a Christmas tree, Halloween can also have its very own Halloween tree. Design twigs in a vase with colorful flowers hanging from the branches all colored in Halloween hues. Spooky Halloween crows on a branch. If you have a set of toy crows you have recently brought, what better way to display them than in animate form on a twig you can get from the yard. 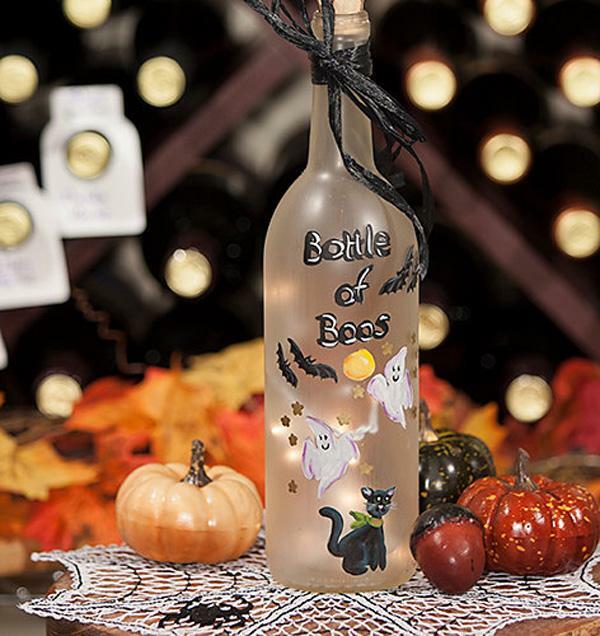 Cool and creative looking Halloween bottles. 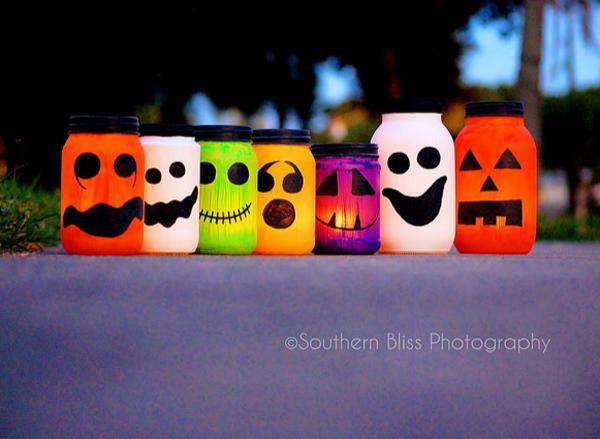 When you have all that energy to paint on some spooky faces on bottles, then this is the perfect Halloween craft for you. Floating Halloween balloons. Very simple and fun to since all you need to do is get yourself some balloons, tissues and markers to complete the ghastly faces on the balloon. 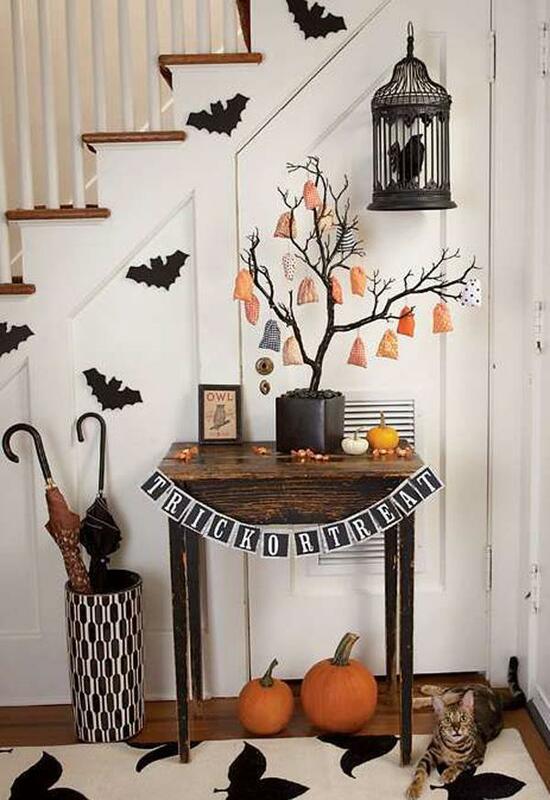 Design your house in the perfect Halloween décor with the Halloween tree, bats, pumpkins and even your own cat with this ensemble as reference. You can even add Halloween themed rugs to match the occasion. This is a good way to spook the wits out of everyone who enters the bathroom. 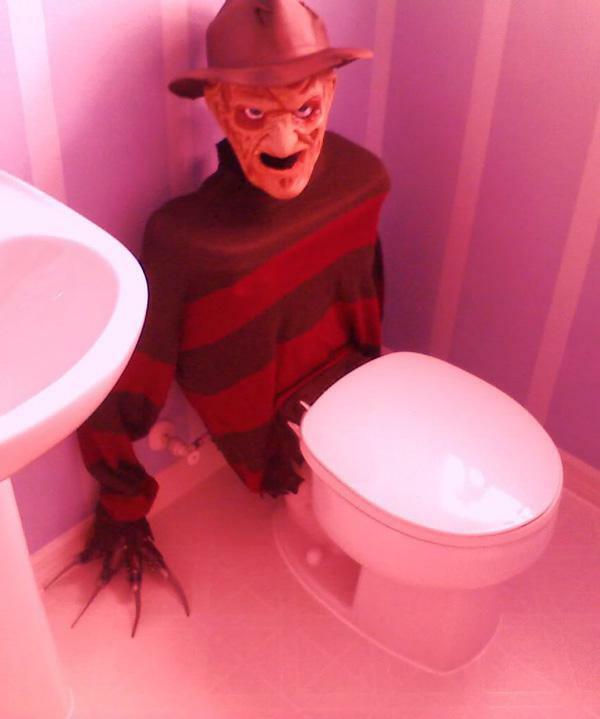 Sport your on Freddy Krueger doll on the bathroom. All you need is to dress the toilet in his mask and costume and viola! Classy skeleton head wreath, even skeletons need to feel beautiful while sporting flowers and cobwebs beside their heads. A really creative and one of a kind Halloween décor you can make yourself. Witch door guardians. Guard your home this Halloween with a pair of witches in hiding. 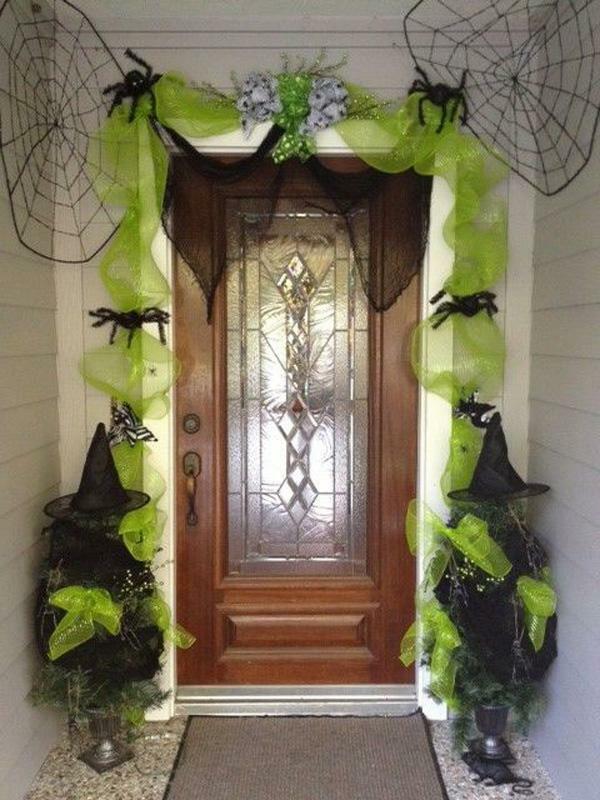 Simply get witches hat and costume and station them on your porch so they look like silently guarding your sanctuary. Giant spider guard for the home. 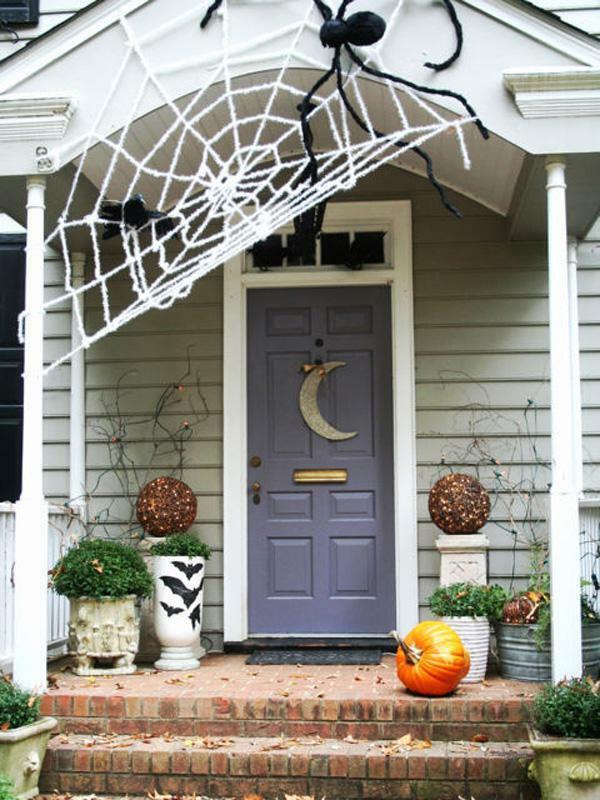 When you are done decorating your front porch with pumpkins and half moons, turn it up a notch with a huge spider dangling from a cobweb tied to your home. You don’t even need to by anything and just use what you have at the house. Spooky ghost specters and a twig wreath. 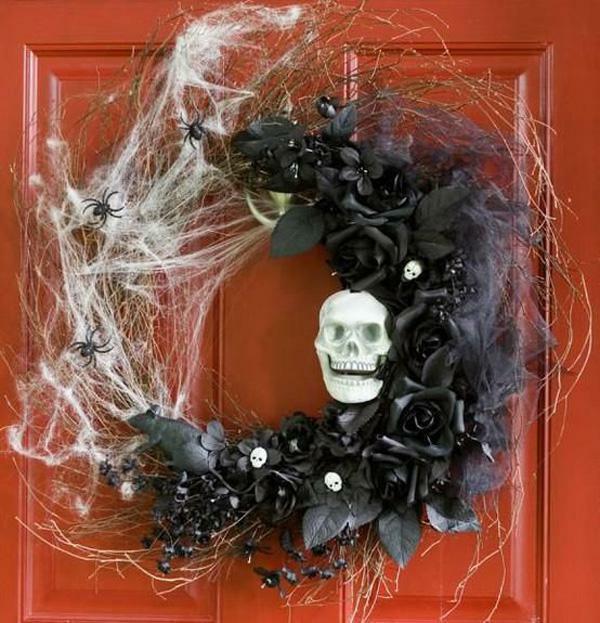 Design your doorstep with this Halloween ensemble and add more drama with putting random twigs encircling the doorway. 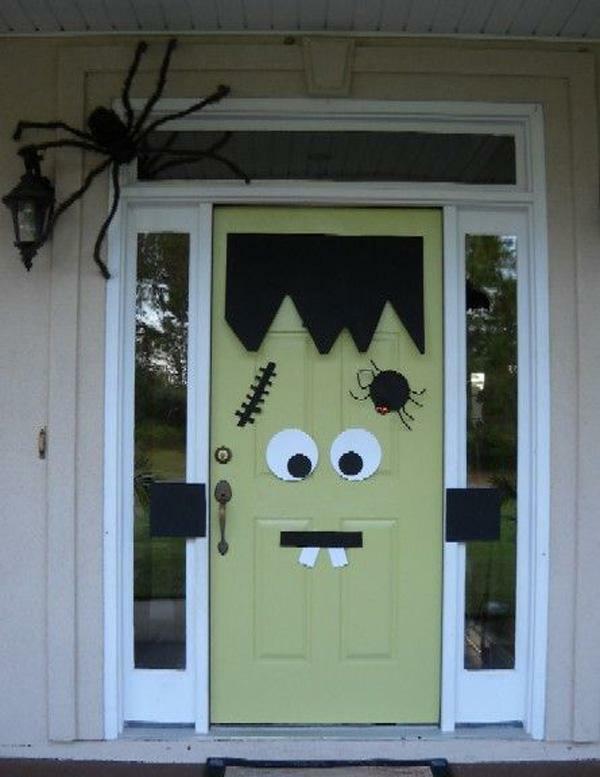 Freaky and cute Frankenstein doorway. It’s not as complicated as it looks. All you need are cut outs to form just about any face of Frankenstein you would want to have. You magazine is full of great ideas, that I can’t wait to try. Do you put out an issue prior to any holiday with craft iseas for the up coming holiday? You have great ideas that I have to wait til next year to try.